You are here: Home / News / Science and Environment / Recycling Has Really Taken A Beating Lately, But Will The County Of Maui’s Proposed Waste Conversion Facility Really Keep Most Garbage Out Of The Landfills? When you live on a small island located more than 2,500 miles from a major land mass, trash is everything. That’s why it’s not surprising that the word “recycling” appears repeatedly in the County of Maui’s General Plan–the 100 or so page document that will supposedly guide the county through the year 2030. The implication is simple: the county of Maui needs to do more, not less, in the world of recycling. It needs to make it easier, not more difficult, for residents to get their waste separated. It should encourage, not discourage, people to keep materials that can be recycled from getting buried in our ever-shrinking landfills. The Integrated Solid Waste Management Plan (ISWMP), which was completed in 2009 during Mayor Charmaine Tavares’ administration, is more specific. When published, the county diverted about 30 percent of its waste to recycling, composting, etc., with the rest going to landfills. Today, that figure hovers between 30 and 40 percent (depending on how you measure it), according to Department of Environmental Management Deputy Director Mike Miyamoto. Of course, the State of Hawaii had called on counties to be diverting 50 percent of their waste away from landfills by year 2000. So, yeah. While county officials says they’re taking steps to ensure that the county will soon divert 80 percent of its waste away from landfills, it’s not exactly doing so by increasing recycling efforts. Instead, it’s working towards constructing a large “Waste Conversion Facility” (more on this later). In fact, in the last few years, the administration has generally tried to steer away from recycling. In March 2013, Mayor Alan Arakawa announced that the county would close its many recycling drop boxes, insisting that the private sector could now handle all the county’s recycling needs. He backed off a few weeks later, after residents howled in protest. But on Feb. 1, the county will officially end a pilot curbside recycling program that began two years ago for 1,750 South Maui residents (many in Maui Meadows), citing the effort’s costs, which county officials say are prohibitively high. Curbside recycling is simple: residents place recyclable materials into three county-provided 96-gallon bins (one each for garbage, mixed recyclables and greenwaste), which a county truck then picks up and takes to a materials processing center. Maui Recycling Service already offers the program to residents, but the 2009 ISWMP recommended that the county institute the service for residents (thousands of Mainland cities have been doing curbside recycling for decades). Two years ago, on Feb. 11, 2013, Environmental Management Director Kyle Ginoza testified about the project before the County Council’s Infrastructure and Environmental Management Committee. He noted that the 2009 ISWMP recommended that the county begin a curbside recycling program for residents, and said the project was part of the county’s effort to “work toward 60 percent landfill diversion.” But Ginoza also told the committee that Maui would have to ship the recyclables (save the green waste, of course) off-island to “markets paying the most.” When amortized over 10 years, Ginoza told the committee that the program would cost residents “approximately $80” per year per account. But MauiTime obtained a spreadsheet, produced on Aug. 16, 2013 by County Recycling Coordinator Hana Steel, that suggests the curbside recycling program’s costs were actually much lower. In fact, the sheet states that the total average program cost per account per year was just $43.91. Miyamoto disputes that figure, saying the spreadsheet “wasn’t complete” and didn’t include various factors. He also said supervisors never reviewed it. MauiTime obtained the spreadsheet from a source familiar with the recycling program. We originally requested the document from the county under the state’s public records laws, but the county Corporation Counsel’s office refused, saying the spreadsheet was a “draft” document and thus exempt from release. Efforts to contact Hana Steel were also unsuccessful. The county placed her on paid “administrative leave” in July. Miyamoto declined to say why this happened, saying it was a “personnel issue” (he also said he didn’t know how long Steel has been on leave). Steel also declined to comment for this story. “I am so sorry, but I am not at liberty to comment on this issue or any recycling issues,” Steel emailed me on Jan. 7. Steel also isn’t the first Environmental Management official placed on administrative leave in the last few years. In February 2013, according to court records, then-Solid Waste Division Director Tracy Takamine (Steel’s boss) was placed on paid leave for allegedly threatening an employee (who was apparently later fired) he was trying to discipline. A few months later, court records show, the county fired Takamine. He’s currently suing the county, alleging wrongful termination. What’s more, in September 2014 the Maui County Council authorized a performance audit of the entire Department of Environmental Management. “It has been difficult working with the department,” Maui County Councilmember Elle Cochran said in a Sept. 5, 2014 Office of Council Services blog post on the audit. In any case, Miyamoto said a few residents (mostly from Maui Meadows) have contacted the county, saying that they’d like the curbside program to continue. He said he tells them to contact Maui Recycling Service, which offers curbside recycling. “Is it possible to revisit the decision to stop the recycling program in Maui Meadows?” resident Francesca Carey asked Ginoza in a Jan. 4 email we obtained. Another resident, Teri Sherrow, was even more critical in her email to the county. Reached by phone, Sherrow said Ginoza never responded to her email. During a Jan. 12 County Council Infrastructure and Environmental Management Committee meeting, a number of Maui Meadows residents testified that the three-can program was incredibly popular in their neighborhood and called for its reinstatement. They also asked that the county at least continue to pick up the greenwaste bins–an idea Ginoza said was “interesting,” though admitted he hadn’t thought of it before, The Maui News reported on Jan. 13. In his phone interview with me, Miyamoto disputed the notion that the program was popular. In fact, he said the initial set-out rate for the bins was “high,” meaning a lot of residents were putting all three bins on the curb–at first. But then, he said, the rate fell to about 57 percent. Never mind that it could take a family more than a week to fill a 96-gallon bin full of paper, cardboard, plastics and glass. Or that officials told the County Council on Jan. 12 that they’ll just the store all those curbside recycling bins–which apparently cost the county $280,000–at the Waikapu Landfill. Regardless, county officials are done with curbside recycling. Besides, they insist they have a better idea. About a year ago, Arakawa invited a few county officials, including Ginoza, and representatives of the energy firm Anaergia Services to his Akaku television program Your County With Mayor Arakawa. They were there to sign a new contract to build what the county refers to as an Integrated Waste Conversion and Energy Project (IWCEP). According to county officials, the IWCEP promises to do divert even more waste away from the county’s landfills while also making money–something they say curbside recycling couldn’t do. The county’s Request for Proposals for the facility came out in 2012. That document states that the IWCEP will tap into residential and commercial waste streams; “materials that are currently composted;” “other recyclable materials that are controlled by the County” (fats, oils, grease); and landfill gas that is currently flared at the Central Maui Landfill. On paper, this looks dynamite. Then again, it’s all just on paper at this point. Whereas the curbside recycling program was operational for two years before the county pulled the plug, the soonest the IWCEP could go online is 2017, Miyamoto said, though the contract stipulates that it be up and running by 2019. What’s more, the 2009 Integrated Solid Waste Management Plan recommended that the county build a waste-to-energy facility in addition to having programs like curbside recycling–not instead of it. “We’re accelerating it because the waste facility will be able to divert 80 percent of waste that goes to the landfill,” Miyamoto said. What exactly the facility will look like–and what technologies it will feature–is also not really known. Remember–the proposed IWCEP will supposedly do a great deal. It will take in a huge percentage of the waste normally sent to the landfill; separate it all at a materials recovery facility; process recyclables like plastics, cardboard and glass; use an anaerobic digester that will produce biogas that can be burned as a fuel; and make compost materials. The facility will also produce these small pellets that Miyamoto said could be used as a coal substitute. The 2012 RFP was very specific that the facility only use proven processing technologies that are currently in use. But when I asked Karl Bossert, an official with Anaergia who attended Arakawa’s contract signing last year, for operating examples of the kinds of technology the IWCEP would use, he couldn’t really name any. “All the technologies are demonstrated and operational,” he said. He added that one facility in Anaheim, California (which hasn’t yet been built) is similar, but will use a different waste stream than that proposed for Maui. When asked about the IWCEP’s current status, Miyamoto said Anaergia is currently negotiating “off-take agreements.” “You have to be able to sell what you’re processing,” Miyamoto said of the fuels and materials the facility is expected to produce. “They’re shopping these fuel supplements around. They have to secure those agreements early this year.” Miyamoto added that Anaergia said that if they can get the off-take agreements done soon, then they can open the facility sometime in 2017. In the mean time, those residents who still believe that recycling is the best way to keep our landfills from filling up too soon will either have to pay Maui Recycling Service to come to their door or just carry recyclables on their own to the county’s drop boxes. For some residents, like Susan Bradford of Kihei, this is just too much. 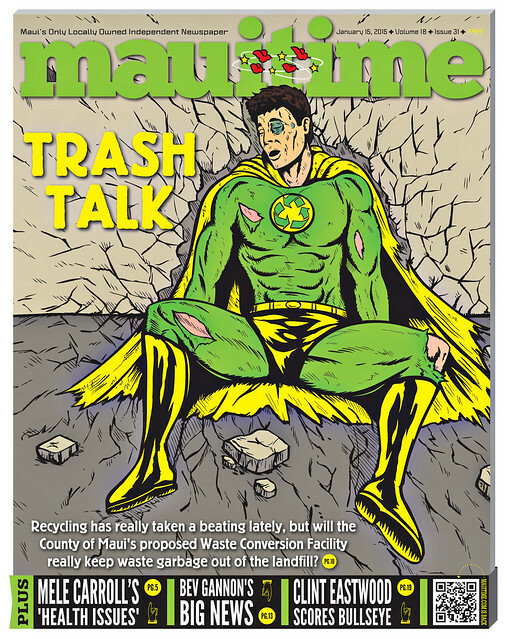 Lmao yessss this article da kind very true brah u know, cus in me neighborhood we be doing bit of curbside recycling and my Brada likes it too cus he after making one lump sum of recyclables he goes to one recycling center and he go come back with plenty the kind green bucks and he goes and rubs it in my face, but I still like it cus recycling is good for everyone and the environment! !